. :: Tutorial : Using the GenX Plugin For DazStudio ::. 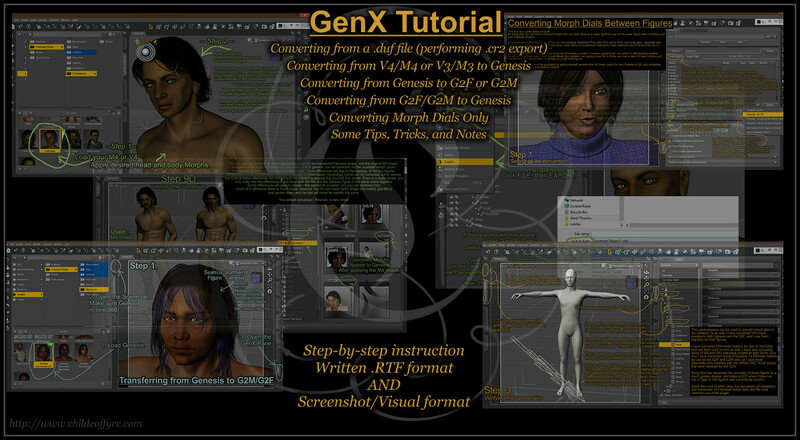 This is a tutorial for using the GenX plugin for DazStudio. You'll need DazStudio, the GenX plugin, and whatever add-ons needed for your desired figures to convert to and from. -- Performing a .cr2 export. -- Converting from Gen3/Gen4 figures to Genesis or the G2's. -- Converting from Genesis to the G2's. -- Converting from the G2's to Genesis. -- Converting individual morph dials from one figure to another. Requires: DazStudio, GenX plugin, any needed add-on packs.